Yesterday, in Part 1 of this post, I critiqued the first part of the Court of Appeals decision affirming the trial court’s denial of her pretrial motion to suppress evidence. I concluded that the Court of Appeals erred because it improperly relied on evidence (1) obtained after the deputy stopped Crane Station and (2) facts invented by the trial court. The Court of Appeals also (3) erroneously claimed that her appellate lawyer had failed to challenge any of the trial court’s findings of fact. I provided links to the decision by the Court of Appeals and Crane’s Opening Brief on Appeal and her Reply Brief. In a related post today entitled How Could Judge Taylor Forget Garcia v. Commonwealth, I discussed a decision he wrote reaching the opposite conclusion on a set of materially indistinguishable facts. You may find that to be an interesting and helpful follow-up to Part 1 since he is one the three judges who decided her case. I also referenced Crane’s Petition for Rehearing of the decision by the Court of Appeals just so there is no misunderstanding or confusion regarding whether her lawyer challenged the findings of fact. This first part of the decision by the Court of Appeals stands for the proposition that a motion to suppress based on an argument that a police officer lacked a reasonable suspicion to stop someone can be decided on the basis of information he acquires after the stop. Likewise an argument that a police officer lacked probable cause to arrest can be decided on the basis of evidence that turns up after the arrest. Both principles are contrary to long established federal and state case law and eviscerate the Fourth Amendment. Therefore, the Kentucky State Supreme Court must grant discretionary review and reverse the Court of Appeals. If it does not, trial courts across the state will create havoc by following the decision by the Court of Appeals and denying motions to suppress in violation of a long line of state and federal cases. Eventually, the Supreme Court would have to grant review in one of those cases and overrule the Court of Appeals in the Leatherman case. That is why it is necessary to grant discretionary review. Today, I will critique that part of the decision that deals with Crane’s statement that her watch had fallen behind the seat during the ride to the hospital and her request for the deputy’s assistance to retrieve her watch for her. Tomorrow in Part 3, I will deal with the final issue; namely, the decision by the Court of Appeals that the trial court properly denied her motion for a directed verdict of acquittal on the DUI charge. Due to the length of today’s article, I have decided that I should discuss the latter issue in a separate post. When Deputy McGuire assisted Crane to get out of the back seat of his patrol vehicle at the hospital (because she was handcuffed with her hands behind her back), she told him that her watch had fallen off her wrist and dropped behind the rear seat during the ride. She asked him to please retrieve it for her. That is undisputed. At the preliminary hearing, McGuire testified that, after they returned to his vehicle following the blood draw, he pulled the seat back, saw the watch and the suspected controlled substance near it, and seized both of them. When her lawyer asked him if he could see the two items before he pulled the seat back, he said. “No.” However, at the suppression hearing, he testified that he saw both items in “plain view” sitting at the top of the seatbelt crack next to where she was sitting when he opened the door to assist her to get out of his vehicle at the hospital. Those two statements are mutually exclusive. They cannot both be true and there is no question that Crane’s lawyer was entitled to challenge the deputy’s credibility at trial by impeaching him with his prior inconsistent statement under oath at the preliminary hearing. Nevertheless, the trial judge sustained an improper objection by the prosecutor to that line of inquiry preventing him from eliciting the inconsistent statement. Why did the trial judge do that? Before jury selection, the trial judge granted the prosecutor’s motion in limine (i.e., at the beginning) for an order preventing the defense from introducing Crane’s statement about her watch and her request for his assistance in retrieving it on the ground that her statement was inadmissible hearsay. I have addressed this issue previously in Hearsay, Part Deaux. The judge’s ruling was improper because the statement was not hearsay, since it was not offered to prove the truth of the matter asserted in the statement. It was offered to show that, as a result of something she said (and it really does not matter what it was, which is why it was not offered to prove the truth of the matter asserted), he pulled the seat back to look for her watch and found both the watch and the suspected controlled substance in proximity to each other. There is nothing misleading or improper about allowing the jury to hear that evidence because that is the way it happened, according to the deputy’s testimony at the preliminary hearing. Instead, the jury only heard the deputy’s trial version of his discovery, which was that he found her watch and the suspected controlled substance in plain view on top of the rear seat in the seatbelt crack right next to where she was sitting. To make matters worse, in his final summation the prosecutor said the proximity of her watch to the suspected controlled substance in plain view amounted to her “autograph” on the controlled substance and she had not offered any explanation for how they happened to be in plain view together in the seatbelt crack right next to her. It’s not surprising in the least that the jury found her guilty of possession and evidence tampering for attempting to conceal the rock of crack. Would the jury have convicted her if they knew that the deputy found the rock not in plain view, but under his back seat because she asked him to retrieve her watch from under the seat? I do not believe the jury would have convicted her because who would ask a police officer to retrieve their watch from under the seat, if they had lost the watch while attempting to slough a controlled substance? That was her defense, but the trial judge took it away from her with his ruling in limine. The Court of Appeals did not decide whether her statement about her watch and request for his assistance to find her watch was inadmissible hearsay. Instead, it dodged the issue by saying the error, if any, was harmless because she could have testified about her statement and request. Indeed, the Court of Appeals noted that the trial judge told her that she could testify about it. Why does this not make any sense? (1) If the statement were hearsay, it is not admissible, whether or not she testifies. That is the law and the trial judge cannot create an exception that does not exist. (2) She had a constitutional right under the Fifth Amendment not to testify and a right to have the judge instruct the jury that it cannot hold her silence against her. In other words, silence is not evidence of guilt. (3) The judge’s unlawful exception was a manipulative and coercive effort to force her to testify against her will in violation of her Fifth Amendment right to remain silent and not have her silence held against her. (4) If she had testified, the jury would have been presented with a classic he-said-she-said controversy in which he said he found her watch and the rock together in plain view at the top of the seatbelt crack on the seat right next to her, and she said he found it under the seat after she asked him to look for her watch. Not even the longest long shot Louie at Hialeah would put a fin on her fate in such a swearing contest. (5) Who could deny that the odds on the outcome of that he-said-she-said swearing contest would change dramatically, if the jury found out that the deputy had previously testified under oath at the preliminary hearing, about a week after her arrest, confirming her statement. The suppression hearing was five months after her arrest and the trial was 18 months after her arrest, by the way. There can be little doubt that the jury would have believed her and disbelieved his plain-view testimony. Then their whole case falls apart. (6) That is why her lawyer’s attempt to cross examine the deputy by impeaching him with his prior inconsistent statement under oath at the preliminary hearing was proper and legitimate. To call this error harmless is disingenuous and absurd. But guess what? That is not even the right test. Why is it not the right test? The trial judge’s order in limine and his ruling preventing her lawyer from impeaching the deputy with the deputy’s prior inconsistent statement under oath at the preliminary hearing took away her defense. A defendant in a criminal case has a constitutional right to put on a defense and her right to do that was denied to her by the trial judge’s rulings and aggravated by the prosecutor’s closing argument in which he commented on her silence, which is forbidden by the Fifth Amendment. He also attempted to switch the burden of proof over to her to prove her innocence, which is a denial of due process of law under the Fifth and Fourteenth Amendments. When the court and a prosecutor violate a defendant’s constitutional rights, the test presumes the error affected the outcome of the trial and the prosecution must rebut that presumption by proof beyond a reasonable doubt that it did not.That is a far different test from the one employed by the Court of Appeals. There is no way the prosecution can meet its burden in this case. Therefore, the Court of Appeals must be reversed on this issue. Until tomorrow . . . The Bill of Particulars is a document, prepared and sworn to under oath by the prosecution (ie, The Commonwealth) and filed with the court. The bill discloses the evidence the prosecution intends to introduce at trial. In Crane Station’s case, the Bill of Particulars also contained a plea offer: if she would plead guilty to all three of the pending charges, the prosecution would recommend a prison sentence of eight years (four years on the possession and four years on the tampering to be served consecutively or end to end, plus seven days for the no-drug/no-alcohol/no bad driving DUI). We did not see this document until just before the trial, probably because Crane Station had made it clear to her attorney at the time, Will Kautz, that she would not plead guilty, regardless of any plea offer — even if it were an offer for a Caribbean vacation — so he did not show it to her, even though he had a duty to do so. 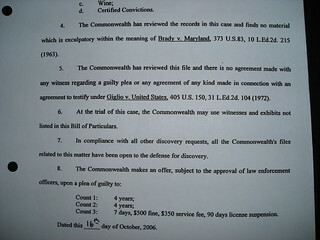 The bill contained a materially false misrepresentation, namely, that the prosecution had “no exculpatory evidence” under Brady vs Maryland (a United States Supreme Court case that requires the prosecution to disclose all exculpatory evidence to the defense), when, in fact, it had two exculpatory vitally important lab reports in its possession: (1) a Kentucky State Crime Lab report by Examiner Neil Vowels finding no alcohol in her blood sample and (2) a Kentucky State Crime Lab report by Laboratory Technician Ryan Johnson finding no drugs in her blood sample. 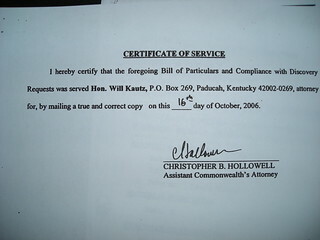 The prosecutor who drafted and signed the bill on October 16, 2006, declaring under penalty of perjury that its contents were true is Christopher Hollowell, who is now a McCracken County District Court judge. The exculpatory drug test result was dated and signed by Ryan Johnson September 25, 2006, which is almost a month before now Judge Hollowell signed the Bill of Particulars declaring under penalty of perjury that the prosecution did not have any exculpatory evidence. The bill was filed in the Clerk’s Office the next day on October 17, 2006. Fortunately, Crane Station’s lawyer, Will Kautz, who knew that her blood sample had been sent to the crime lab for drug and alcohol analysis, kept demanding the lab results. 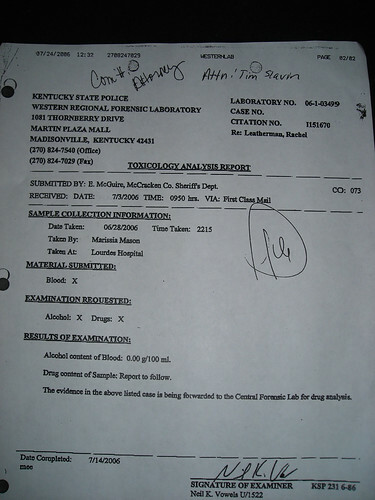 The alcohol result was finally disclosed when we viewed the evidence in the evidence unit at the McCracken County Sheriff’s Department in late October or early November, but the drug result was withheld until the beginning of the suppression hearing on November 26, 2006. 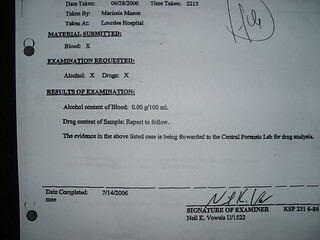 We believe the prosecution deliberately withheld the exculpatory lab results from Crane Station and concealed the exculpatory alcohol report from the grand jury in an effort to mislead the grand jury in order to obtain an indictment and cause her to give up hope and plead guilty unaware of the results. We suspect but cannot prove that the prosecutor’s office routinely withholds exculpatory evidence hoping that depressed and dispirited defendants will give up and plead guilty. This shows what little regard the prosecution has for the accused, due process of law, the rule of law, the members of the grand jury whom they are misleading, and the important role of the grand jury to determine whether probable cause supports each charge in an indictment. Consider that there is, in effect, no speedy trial rule in Kentucky and defendants who insist on a jury trial in McCracken County have to wait approximately 18 months before they go to trial. Bail bondsmen are prohibited in Kentucky. If defendants are unable to post bail, they have no choice but to rot in jail until trial. Pretrial detainees are not segregated from inmates serving sentences for misdemeanors and felonies. All are mixed together in general population in the McCracken County Jail. Frog Gravy gives you an honest unvarnished look at what that is like. Given how prosecutors and police probably routinely ignore people’s constitutional rights, how can there be any surprise that innocent people plead guilty in McCracken County? Crane Station was fortunate to make bail, but I fear she is the exception rather than the rule. Bill of Particulars filed October 17, 2008 by Crane-Station on flickr. Sworn under oath and delivered. 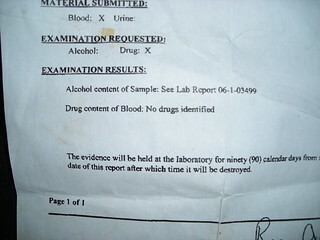 The hidden exculpatory blood test result for drugs. 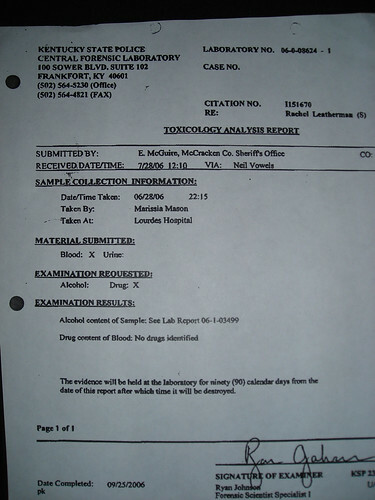 The hidden exculpatory drug test result (under Brady), enlarged. These lab results have been published online in other posts as well. Amazing coincidence that Crane-Station received an eight-year sentence after the jury trial. Investigatory Stop Or Voluntary Citizen Initiated Contact With Police? An interesting Fourth Amendment issue arises from time to time regarding whether a police officer initiates a contact with a person operating a motor vehicle by pulling it over, or the driver voluntarily initiates the contact by stopping the vehicle and signals for assistance by turning on the vehicle’s blinking hazard lights, as might be the case for example, with a health emergency, a flat tire, or running out of gas. With few exceptions, the first situation is prohibited by the Fourth Amendment, unless the officer has a “reasonable suspicion” that the motorist has committed, is committing, or is about to commit a crime. A reasonable suspicion is more than a mere hunch because it must be supported by an articulable set of objective facts and circumstances that would cause a reasonable person to suspect that the individual being observed had committed, was committing, or was about to commit a crime. In the standard drunk driving case, for example, an officer would have a reasonable suspicion to believe the operator of a motor vehicle was impaired by alcohol if the vehicle was weaving, crossing the center line, exceeding the speed limit, and speeding up and slowing down erratically. The courts apply a flexible totality of the circumstances test in determining whether the officer’s suspicion was reasonable in any given case. The courts will not consider information acquired after a stop because the officer did not know it prior to the stop and could not have relied on information he did not know. The second situation is not subject to the Fourth Amendment because there is no seizure when a police-citizen contact is initiated voluntarily by the citizen, or the citizen appears to require assistance. This means that an officer does not have to have a reasonable suspicion to contact a citizen who initiates the contact, or otherwise appears to require assistance. This distinction certainly makes sense when one considers, for example, the plight of a motorist who may have suffered a heart attack, turned on the hazard lights, pulled over, and stopped the vehicle before lapsing into unconsciousness. It would not make any sense to require a police officer to have a reasonable suspicion to believe that the apparently unconscious person was committing a crime to justify stopping to check on the person. Unfortunately, however, the distinction between an investigatory stop that requires a reasonable suspicion under the Fourth Amendment and the voluntary citizen initated contact with a police officer that is not subject to the Fourth Amendment is not always easy to determine. As with the reasonable suspicion test, the courts consider the totality of the circumstances and ask whether a reasonable person in the same set of circumstances faced by the person in the case under review would have believed that he was free to terminate the contact at any time and drive away rather than remain and submit to the authority of the law enforcement officer until released. This issue was raised by the prosecution in Crane-Station’s case. The trial judge agreed with the prosecution and ruled that the arresting officer, McCracken County Sheriff Deputy Eddie McGuire, did not require a reasonable suspicion to pull her over because she had voluntarily initiated a citizen-police contact to which the Fourth Amendment did not apply. Consider the following evidence, apply the legal rules that I have set forth and explained for you, and see if you agree with the trial judge’s conclusion. At the suppression hearing on November 27, 2006, Deputy McGuire testified that he was dispatched to investigate a 911 call. After he arrived, he checked the neighborhood for a few minutes looking for a dark blue Buick LeSabre with Washington plates that was described the caller. When he did not find it, he cleared the call and headed back toward town on U.S. Highway 60. As I was passing the vehicle she had her left blinker on as if she was going to turn out in the passing lane, but she never did. And then as I was going to go ahead and go past her, I noticed that the license plate – it was a Washington license plate was the description that was also given at the time of the call. So when I noticed that, I slowed down and let her go back by me, and then when I pulled in behind her, she pulled over. I just pulled in behind her, and she started to pull over. That’s when I lit her up. I was going – yes. She didn’t bring my attention as far as weaving or nothing like that. Speed wasn’t a factor. Defense counsel focused on the blinking left-turn signal with a few questions. Q:	Okay. And apparently, your testimony is that she had on her turn signal? A:	She had her left-turn signal on as if she was going to come into the left lane. That’s what brought my attention to that vehicle to begin with. And then as I was passing her, I noticed it had Washington tags. Q:	— saw your vehicle and elected not to? A:	She turned her other turn signal on when she was going into the emergency lane just to stop. Q:	When she was getting ready to pull over? Q:	So, technically, you did stop the vehicle? A:	I was going to, anyway, yes. When she started to pull over, I just went ahead and turned my lights on. A:	She – yeah. I suppose she assumed I was going to stop her, so she went ahead and pulled over anyway. Q:	Safe assumption under those circumstances? Consider also that Deputy McGuire wrote in his Uniform Citation and Offense Report that he stopped her, which he confirmed in testimony under oath at the Preliminary Hearing and before the Grand Jury. 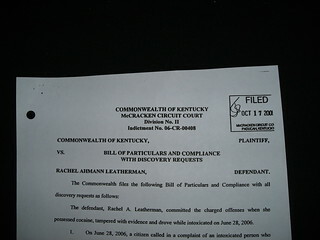 In addition, on October 17, 2006, Assistant Commonwealth’s Attorney (now a McCracken County District Court judge) Christopher B. Hollowell prepared and filed the Commonwealth’s Bill of Particulars declaring in pertinent part under penalty of perjury that Deputy McGuire “stopped” her vehicle. The critical question then is whether a reasonable person in Crane-Station’s position would have pulled over into the emergency lane and subsequently stopped her vehicle after a police officer, who had pulled alongside her, slowed down, fell in immediately behind her, and activated his emergency lights as she moved over into the emergency lane? We do not believe the answer to this question is reasonably debatable, especially since the officer who pulled her over wrote in his report and consistently testified under oath at three different pretrial hearings that he “stopped” her. Finally, in the suppression hearing, he testified that he intended to stop her and he conceded that her reaction to his behavior by pulling over and stopping was reasonable under the circumstances. He was the only witness who testified at the suppression hearing. We believe that only outcome driven judicial mendacity by the trial judge and the Court of Appeals, aided and abetted by a strong dose of prosecutorial legerdemain in formulating an argument unsupported by the police officer, who was the only witness, could conclude on this set of undisputed facts that Crane-Station voluntarily initiated a citizen-police contact. Author’s disclosure: Crane-Station is my wife. We were married and I was a law professor when this incident intruded into our lives. Cross posted at Firedoglake/MyFDL and at the Smirking Chimp. You are currently browsing the archives for the Prosecutorial Legerdemain category.